IPaSS has an open referral system and we are involved with children across the whole pre-school age range (0 to 5 years). With most of the families our role is essentially a facilitator with respect to play, development of parental skills, and general guidance on the implications of visual impairment, physical difficulty and hearing impairment in young children. We will also provide support and guidance on the use of specialised toys and equipment. To make a referral, please download and complete the Referral Form. 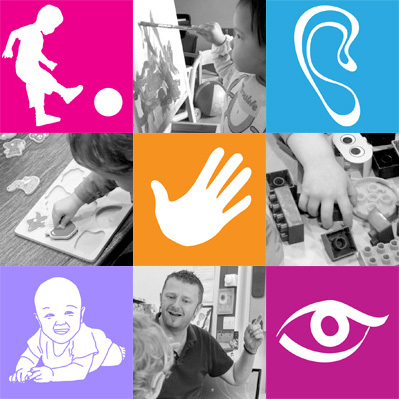 If and when appropriate, IPaSS will conduct an assessment of the child's visual functioning, as well as assessing their skills with respect to progress in the areas of cognitive, language, social, self-help, tactual and motor development. The level of our involvement will vary according to the needs of the individual child but the rationale for intervention is to ensure that the threat to any normal child development is minimised, and that the child is given every opportunity to thrive and learn both at home and in any early year's educational setting. A small number of children are so severely visually impaired that it is predictable they will need a tactile learning medium such as Braille, Moon, objects of reference or extensive adapted learning resources when they start school. When it appears that the child has multiple needs and a visual impairment it is unlikely that IPaSS will be the sole agency involved; usually with multiple needs we will work in an advisory way with the Portage Service and the parents/guardians, again offering advice regarding adaptations and how to access/maximise learning opportunities. Support to children and their families from the moment deafness is diagnosed. Liaison with other relevant professionals, including Social Services, Speech and Language Therapists, Children's Centres and Audiology clinics. Specialist equipment such as radio aid systems, training on management, use and in-house technical support. The PD team support preschool children in nurseries and preschool settings once a referral has been submitted. An assessment then takes place and the results of the assessment determine if the Physical Difficuties team can support the child and the type of support that can be offered.